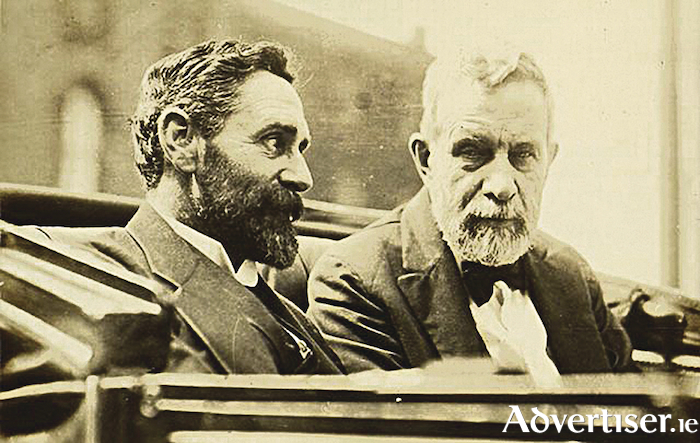 Roger Casement and John Devoy make plans for the Easter Rising in New York 1916. While many of the 700 volunteers who came out in County Galway during the Easter Rising, were being rounded up and shipped off to prison in England, their leader Liam Mellows managed to slip away to Liverpool dressed as a priest. From there he managed to work his passage to America. In another of his escapades he organised the escape of six Fenians from Fremantle prison in Western Australia aboard the whaleboat Catalpa, to the great glee of his American and Irish friends; and to the anger of the British. He financed and supported Roger Casement’s plan to buy arms in Germany, and to recruit Irish prisoners of war in German prison camps. Devoy immediately gave Mellows a job in his Gaelic American newspaper, where he met, and became friends with Dr Patrick MacCartan. *** The newspaper was the main conduit for information about the activities of Clan na Gael, and the Irish Volunteers. Mellows also went on lecture tours speaking about the Rising, and urging Irish Americans to support a new, emerging, Ireland. For a time everything went well. However, it soon became apparent that the various Irish-American societies were not united. Clan na Gael endeavoured to integrate the Irish issue with American life. Devoy, with his sidekick the politically ambitious Judge Cohalan, and the Clan supported America’s involvement in World War I, something which Mellows vehemently argued against as it meant America and Britain becoming allies. Against the wishes of the Clan, Mellows and another prominent member John Brennan, began their own campaign against Irish Americans being conscripted in the American army which was preparing to join Britain and France and their allies on the battle fields of Europe. Mellows was summoned to a meeting with the heads of the Clan, who gave him a choice: either toe the party line, or be dismissed from his job and from Clan na Gael. Without hesitation Mellows announced that he would continue his anti-conscription campaign on the streets of New York. Things seriously began to go wrong for Mellows when, following Casement’s footsteps, he became involved in trying to buy arms from Germany to be sent to Ireland. He and his friend MacCartan were arrested with a Baron von Recklinghausen, a secret German envoy in New York. It was a big story at the time. Reuters News Agency announced that Mellows had a fake passport made out to P Donnolly; while the New York Times reported that the arrests ‘have frustrated Sinn Féin plans to stage a revolt to mark the anniversary of the Dublin rebellion next Easter.’ Mellows and McCartin ended up in the notorious city prison known as The Tombs, a grim 19th century fortress that rose high over Lower Manhattan, renowned for its frequent executions. Next week: Dev rides into town! NOTES:* The British got wind of the plan through informers, and moved the Irish based regiments abroad, replacing them with regiments from Britain. ** Casement’s plans to recruit Irish soldiers, who were serving in the British army and were prisoners in Germany, was a failure. But he did organise a substantial arms shipment on board the SS Aud, which was stopped by the British navy as it arrived at Tralee Bay April 20 1916. Casement was arrested when he arrived by submarine shortly after. The failure to land those arms was the death knell for the military success of the Rising. *** Dr Patrick Mac Cartan was sent tom the US as an envoy by the IRB. Later he was appointed as the representitive of Dáil Éireann. Sources: I am leaning heavily on Conor McNamara’s War and Revolution - In the West of Ireland, on sale for €17. Page generated in 0.1095 seconds.